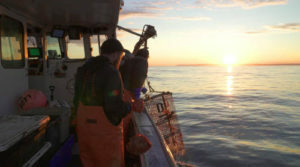 Machias’ Porter Memorial Library will offer a screening of “Lobster War: The Fight Over the World’s Richest Fishing Grounds” on Saturday, March 30. The showing will take place at the University of Maine at Machias Performing Arts Center at 2 p.m.
“Lobster War” is an award-winning feature film about a climate-fueled conflict between the United States and Canada over waters that both countries have claimed since the end of the Revolutionary War. The disputed 277-square-miles of sea, known as the “Gray Zone”, were traditionally fished by U.S. lobstermen. But as the Gulf of Maine has warmed faster than nearly any other body of water on the planet, the area’s previously modest lobster population has surged. As a result, Canadians have begun to assert their sovereignty, warring with the Americans to claim the bounty. The gray zone stretches from Cutler to Jonesport, and the film features interviews with some local fishermen. The event will also feature a lobster raffle and a bake sale. All proceeds from those items and ticket sales will go to support the library’s annual operating fund. Tickets are $5 per person, and may be purchased online here or by visiting the library at 92 Court Street, Machias. Call 207-255-3933 for more information. To learn more about the film, visit lobsterwar.com. Martin Irons author of “Phalanx Against the Divine Wind”. Reading & Book signing. Meet the author. Martin Irons author of “Phalanx Against the Divine Wind”. Twelve crew members died including Hobart MacLaughlan Seaman First Class of Machias. Reading & Book signing. Meet the author. 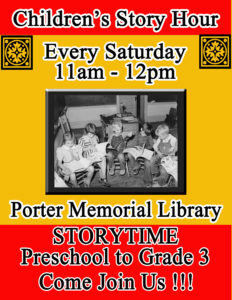 Art Class w/Jude Valentine, sponsored by Maine Arts Commission & Porter Memorial Library. At Machias Veterans Home. A workshop for kids on visualizing sound. What does sound look like? We will explore different ways of looking at sound and experiencing how we hear. Snack & Stories from EFNEP (Expanded Food & Nutrition Education Program) w/Rita Stephenson & Sandy Parsons, Community Education Assistant, UMaine Cooperative Extension. Ages 4-8. Our 2nd Annual Porter Memorial Library Easter Egg Hunt inside the library. Ages 3-9. Hunters will go in two groups, 3-6 get a 10 minute head start before being joined by older children. Donations of candy & eggs are welcome for this, just drop off at the library front desk. Porter Hosts Mountain Man John Colter LIVE!